Leading names in form but are they favourites? Thailand’s Suthasini Sawettabut and Colombia’s Paula Medina are very much players in form; Hungary’s Szandra Pergel is arguably the most successful, whilst Italy’s Georgia Piccolin undoubtedly has a distinct liking for the city of Lagos; they appear amongst the leading names on duty in the Women’s Singles event at the forthcoming 2018 ITTF Challenge Seamaster Nigeria Open. However, are they the favourites for places on the podium at the five day tournament which starts with qualification on Wednesday 8th August? Note the names of China’s Sun Chen and Fan Siqi. At the recent Seamaster 2018 ITTF World Tour Platinum Australian Open in Geelong; in the opening round of the Women’s Singles event, Suthasini Sawettabut caused a major upset; she beat Chinese Taipei’s Cheng I-Ching, the player who on the Women’s World Rankings for August occupies the no.8 spot. Equally, Suthasini Sawettabut is climbing the rankings, in July she was listed at no.59, now she occupies the no.39 spot. Good form from Suthasini Sawettabut in recent weeks; it has been the same from Paula Medina. At the Central American and Caribbean Games in Barranquilla, she was the Women’s Singles silver medallist. Fine performances but how does that compare with Sun Chen and Fan Siqi? Other than the fact that they emanate from a coaching scheme where technical excellence is taken for granted, they have a common factor. The mutual opponent is colleague He Zhuojia, semi-finalist on this year’s Seamaster 2018 ITTF World Tour in both Hong Kong and Australia. On the GAC Group 2014 ITTF World Tour in Argentina Fan Siqi was the Women’s Singles runner up, beaten by He Zhuojia in the final; one year later, Sun Chen won in Pyongyang, the player she overcame in the final, He Zhuojia. In addition in 2016, Fan Siqi was a semi-finalist in Pyongyang. The results suggest that despite the outstanding efforts of Suthasini Sawettabut in Geelong and Paula Medina in Barranquilla; Sun Chen and Fan Siqi are major hurdles to overcome. The evidence is strong. It is the same for Szandra Pergel; winner on the ITTF World Tour in 2012 in Belgium and Croatia but she has yet to repeat the success in Nigeria. Last year she was beaten at the semi-final stage by Egypt’s Dina Meshref, the champion elect. Meanwhile, for Georgia Piccolin, a tough task awaits but she has enjoyed success in Lagos. Last year she won the Under 21 Women’s Singles title. 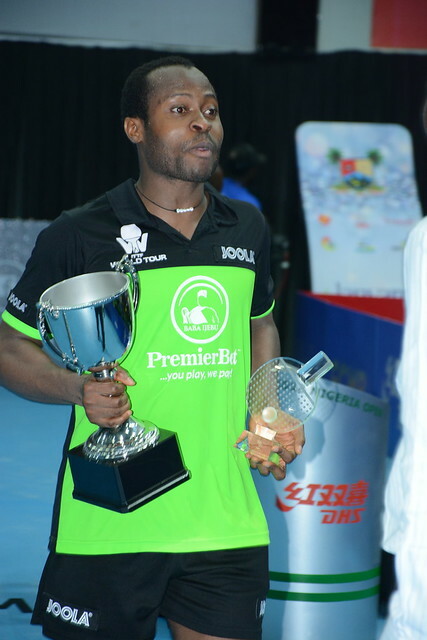 At the 2018 ITTF Challenge Seamaster Nigeria Open, Fan Siqi is the no.12 seed, Sun Chen is not seeded. Suthasini Sawettabut is the top seed ahead of Giorgia Piccolin. Yet to stamp their authority on open international tournaments, Luxembourg’s Sarah de Nutte, Italy’s Deborah Vivarelli and Slovenia’s Alex Galic are the next in line. Paula Medina is the no.7 seed; the host nation’s Olufunke Oshonaike completes the top eight names.